Gordon Lam Ka Tung in the film PARADOX (SAT POR LONG TAM LONG) played the scheming but cautious Cheng Hon Sau. Ka Tung said that this character was similar to his TRIVISA (SHU DAI JIU FUNG) character but with different layers. He said that the film was shot entirely in Thailand. He had to speak Thai. Thus the team arrange for a Thai tutor to teach him his lines. After work he studied Thai at the hotel. He joked that he recited until he was foaming at the mouth. Due to the soft Thai enunciation but sounded a little like Cantonese foul language, Ka Tung hoped what he said was just like a Thai person would. He was very pleased with the shoot completion. He said that he still was unable to speak fluent Thai, bu he had no problem communicating with Thai actors. 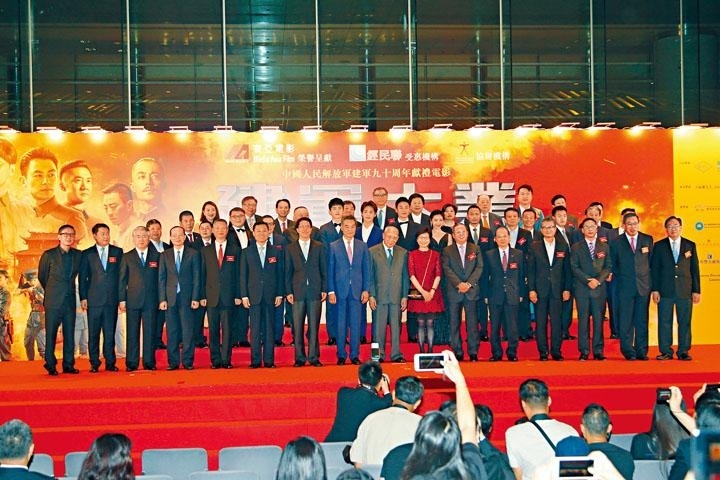 The film THE FOUNDING OF AN ARMY yesterday held a premiere at the Macau Tower. Director Andrew Lau Wai Keung and actors Zhu Yawen, Zhang Hanyu, Liu Haoran and Crystal Zhang Tianai, producer Huang Jianxin and chief planner Han Sanping attended. 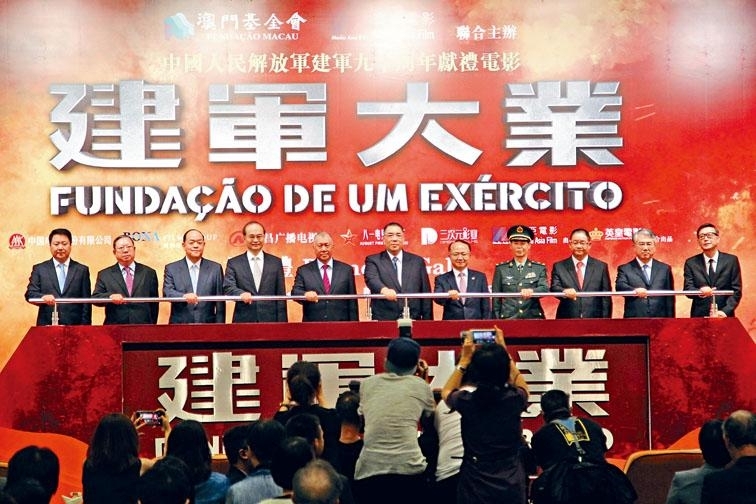 Chinese People's Political Consultative Conference vice chair Edmund Ho Hau Wah, Macau Chief Executive Fernando Chui Sai On, Media Asia group chief Peter Lam Kin Ngok and Bona film chief Yu Dong host the premiere launch ceremony. Yesterday when the host asked director Lau Wai Keung about the challenges of making the film, he said, "The most important is to respect history, to display the framework of history in an even more human way, to make the movie great in order to move everyone and not to disappoint anyone!" Speaking of the film making over 200 million RMB in the Mainland, Lau Wai Keung excitedly said, "It's only the third or fourth day. We will keep on going until September. We just returned from Guangzhou and tomorrow we will go to Beijing, whichever actor has time would take turn and participate in the promotion." As for Hong Kong box office expectation, he sad, "I heard that it hasn't opened in Hong Kong yet and the box office was already pretty good. Earlier at a general audience screenings at the Sunbeam Theaters on July 17h, the reaction exceeded expectation. Young people told me to make another one, the old folks were very excited and emotional from watching it. Their whole body was shaking. I am very happy to have such this type of response outside the Mainland. In addition it also brought back a childhood memory for me, 1,000 people watching a movie together. It felt like watching at a big theater." As for his impression of Macau, Lau Wai Keung said that in 1995 he already frequently made movies there. In 2009 he even made LOOK FOR A STAR (YAU LUNG HEI FUNG) with Zhang Hanyu there. 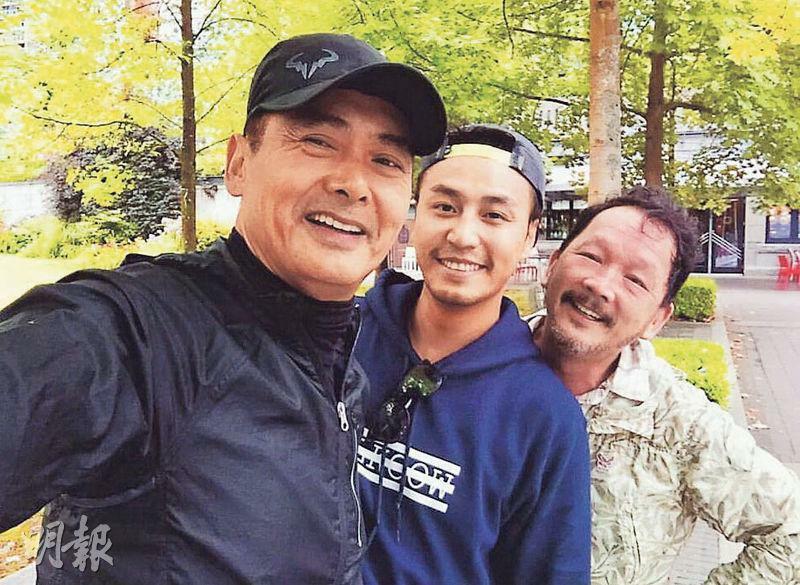 Even Jacky Cheung Hok Yau's music special was shot on location there. Liu Haoran last month went to shoot a variety program in Macau, but due to his busy work schedule he was unable to try the local delicacies. Lau Wai Keung said ha boss Lam Kin Ngok promised to take everyone to the best cuisine in town. Zhang Hanyu joked that they probably would be at an underground restaurant. 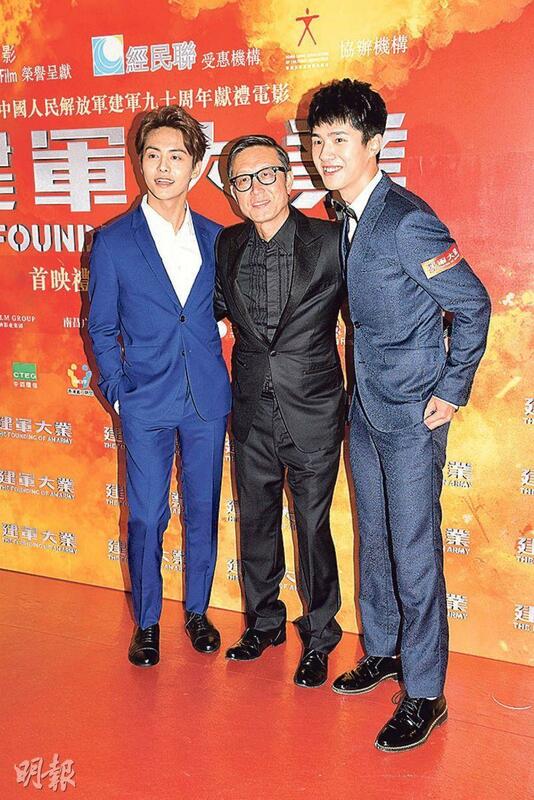 The Han Sanping organized and art directed, Huang Jianxin produced, Andrew Lau Wai Keung directed war epic THE FOUNDING OF AN ARMY last night held a premiere in Wanchai. Media Asia Group's Dr. Peter Lam Kin Ngok represented the team and gave a welcome speech. China Film chief La Peikang, Bona film group chief Yu Dong led Han Sanping, Huang Jianxin, Lau Wai Keung and Zhu Yawen (Zhou Enlai), Zhang Hanyu (Du Yuesheng), Crystal Zhang Tianai (Soong Mei-Ling), Ma Tianyu (Lin Biao) and Liu Haoran (Su Yu) appeared at the premiere. Jacky Cheung Hok Yau, Miriam Yeung Chin Wa, Edmond Leung Hon Man, Dior Cheng Yi Kin, Michael Tse Tin Wa showed their support. The film's chief planner and art director Han Sanping said that he hoped the actors would be suitable for the era, process and historical background. This time he asked director Lau Wai Keung to make the film in order to make the movie even more entertaining, and the goal was reached. Zhu Yawen in the film played Zhou Enlai. He said that the most memorable scene in the entire film was the "April 12th Incident". At the time after the meeting he went outside and saw the blood soaked ground. That part originally had lines. After the first take the director cut all the lines. The several takes after had no line but the result now was even more memorable. Zhang Hanyu who played Du Yuesheng said that at the time Du Yuesheng was only 32, thus when the production began he was somewhat hesitant. He felt that he did not bear much resemblance. Later after the costume fitting he had a lot of confidence. He was very pleased with the resulting performance. Although he only had a two or three minute scene, he had three changes. In additional Du Yuesheng was a historical figure, the performance was very difficult and as an actor he had to explore the role. As for the controversy from all the dissent over all the "fresh meat" in the film, Zhang Hanyu said that he too started as a young actor. Thus they needed the opportunity to grow. Zhang Tianai said that she was very honored to play Soong Mei-Ling. She had a lot of stress during the performance and thanked the director for recognizing her. She also praised that the director really knew how to lead his actors. The 19 year old Liu Haoran was the youngest actor in the entire film. He said that during the shoot he just finished his university entrance exam so he was very familiar with history. His father was a soldier. Did his father give him any suggestion for his performance? Liu Haoran said, "No, but Father gave the film very high praise after watching it." Ma Tianyu who played Lin Biao said that the most memorable was his leg sprain during the shoot. Last night guests aside from Yeung Chin Wa, Leung Hon Man, Ekin Cheng, Tse Tin Wa and Jerry Lamb Hiu Fung, director Lau Wai Keung's wife and four children also showed their support. Edmond said that this was a big film and believed that Director Lau put a lot of effort into making it. 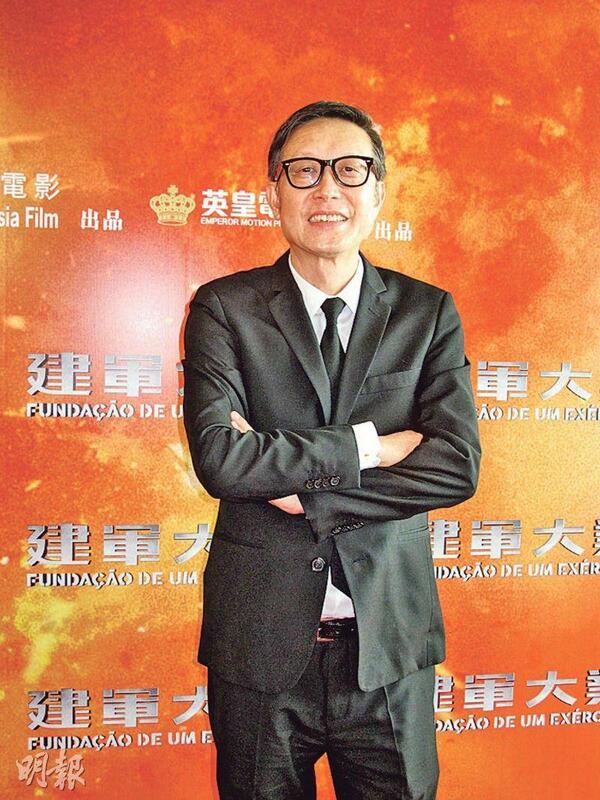 Tse Tin Wa said that historical films were very hard to make. 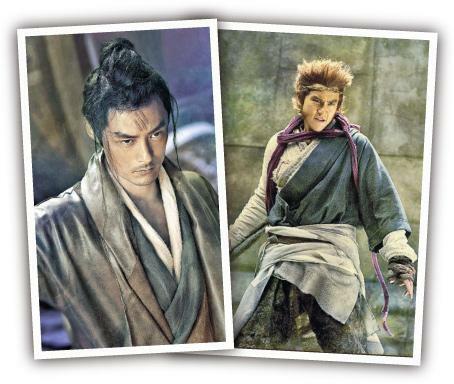 Ekin Cheng said that he has always supported the director. Although he was unable to see the movie, he will later on. He also said that large scale action films were very hard to make, like the Chin Kar Lok movie that he has been working on. After a year in production only half of it has been made. Chin Wa returned from her vacation to attend the premiere. She said that she came to specifically support Director Lau Wai Keung. "THE FOUNDING OF AN ARMY is a big movie. Making a Chinese history film is very hard. As an actor, a colleague, a junior, I have to show my support. Now the film road is very hard, with a lot of challenges to face. It is worth supporting." Chin Wa joked that her driving was decent and she hoped to have a chance to work Director Lau. After attending the premiere, Chin Wa also rushed to attend her husband Real Ting Chi Ko's birthday party. She said that her husband's birthday is actually today. When she left for the event, her son Torres made a cake. She had to wait for the candles to be blown out before being able to leave, so she was a little late. What surprise did she give her husband? 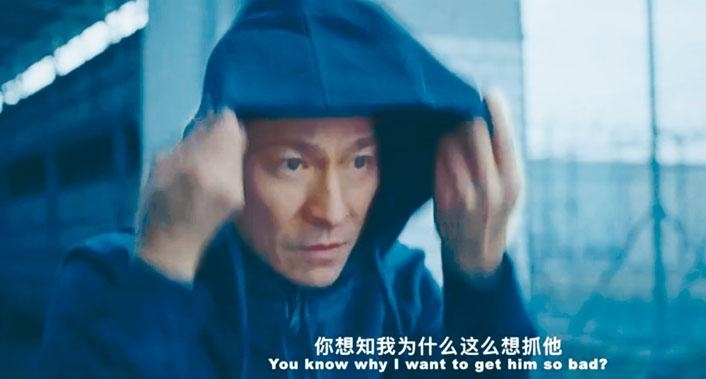 Chin Wa revealed that originally she wanted to surprise him, but he exposed her. "I told my husband's sister to return to Hong Kong for the birthday party. Maybe because he is in public relations, he already saw from the fire exit. The surprise was ruined. Next time I would be better off not to." Korean group BIGBANG member Taeyang, models Kathy Chow Man Kei, Jessica C., Derek Tsang Kwok Cheung and Hilary last night attended a fashion event. 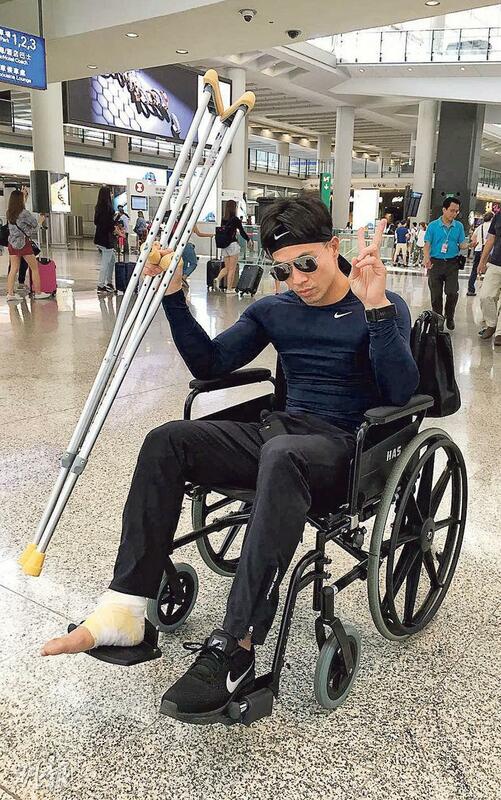 Andy Tien (On Chi Kit) earlier worked on the Jeff Lau Chun Wai directed GONG FU LUEN MUN (KUNG FU ALLIANCE) in Ningbo and injured his right foot. 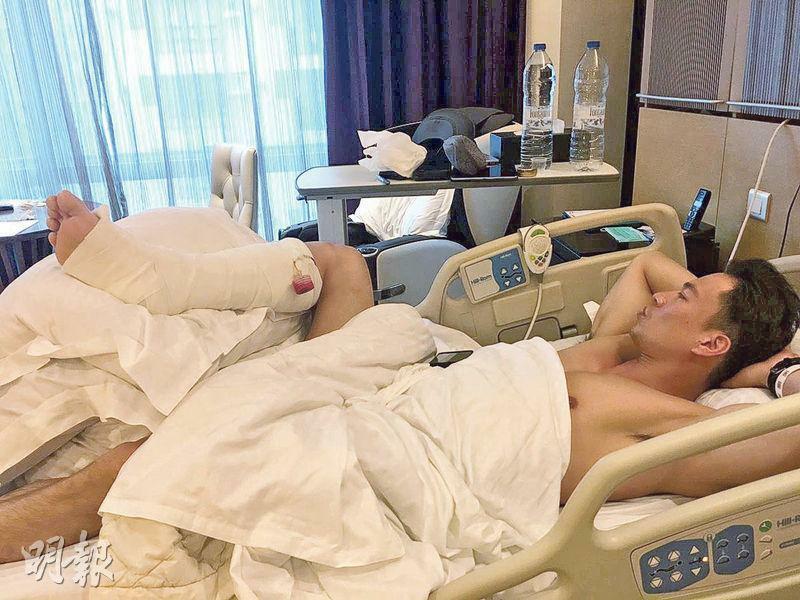 After returning to Hong Kong he immediately went to the hospital for surgery and had to stop working to rest for two weeks. His other half Jessica C. revealed that Andy was recovering a home and keeping their daughter Tessa company. The only thing he was not used to was unable to exercise. Although he stopped working, Andy still missed the film as he was reading the script everyday. Would she keep her husband from working on action films? She said no. "He is an action actor, it is very hard to avoid action scenes. This time is an accident. Actually at the time he was only performing a simple move. Accidents are hard to predict. No matter what he wants to do I would support him." Based on the popular manga by Hiro Mashima of the same name, the Dragon Cry is a dangerous magical artefact with enough power to destroy the world. It was stolen from the temple it was enshrined in and wound up in the hands of the king of the Kingdom of Stella, Animus. Team Natsu of Fairy Tail was tasked with regaining the Dragon Cry. They infiltrate the Kingdome of Stella and meet Animus` aid, a mysterious girl named Sonia. The mission takes a dangerous turn when Natsu`s dragon slayer instincts are forcefully awakened while they are in the foreign kingdom. One day, a sudden disaster breaks out in Hong Kong. All those are infected will go wild and bite others. Not a living person can stay alive for over 5 seconds after being bitten. Accidentally, Sam met his father again who disappeared for years, and Shan’s niece Yan came back from overseas to visit them. They all felt scared and desperate from their friends becoming infected one by one. Sam and Sing do not give up and amend their innovated props to weapons to fight. Finally, whether they could be able to survive? Will they find out the truth and save the non-infected people around? 1941. Hong Kong is occupied by Japanese forces. During the three-year-and-eight-month occupation, the Japanese military pillaged and arrested cultural figures living in Hong Kong. The Dongjiang Guerilla unit was tasked with rescuing these cultural figures and extracting them from the besieged city. The occupation transformed Hong Kong from a prosperous city into a barren land with no food or water. Primary school teacher, Lan – recently separated from her lover, Rong - and her mother are trying to survive this difficult period in their small run-down flat. After the schools are shut down, Lan unwittingly finds herself embroiled in the guerillas’ mission to save novelist Mao Dun. In the process, she meets Hei-zai, the daring captain of the guerillas. Taking notice of Lan’s calm, resourceful nature, Hei-zai recruits her to join the guerillas. Shirley Yim (Suet Lei), Gill Mohindepaul Singh (Kiu Bo Bo), and Tsang Tak Wa yesterday attended a film promotion in Kwun ong. They took turn to learn Muay Thai from Hong Kong Boxing Association president Alex Tsui Ka Kit. Before punching Tsui Ka Kit reminded Tsang Tak Wa to remember to breathe, but during sparring he not only was not able to follow but also kept shuffling his feet and bouncing. Suet Lei said that in the film she played a killer. She killed with knives and guns but she did not have to fight. Thus she hoped to try a fighting film. She said that she liked to exercise and wanted to learn Muay Thai, Wing Chun and get into shape. She hoped to be able to improve her bad habits like slouching and leaning forward. Speaking of work, Suet Lei said that next month she will perform a musical in Sheung Wan, then might tour the Mainland. In the show she played a singer on Temple Street. As for her singing, Suet Lei said that a singer taught her to sing from her energy center and said that her singing was OK.
Andy Lau Tak Wa two days ago asked on his official platform, "Are you ready?" 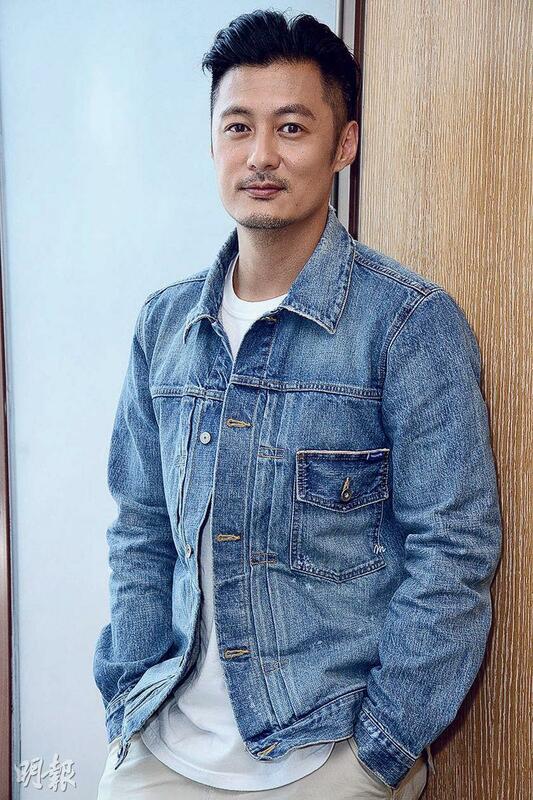 Yesterday his film THE ADVENTURERS (HUP DOH LUEN MUN) officially confirmed that Wa Jai will return soon, at the Hong Kong film premiere in August 22nd. Resting only half a year after his serious injury, Wa Jai's recovery has become a concern for everyone. Many fans left messages on Wa Jai's official site to express their well wishes. Speaking of the toughest part of the film, Wa Jai remembered the factory fight. "The dust in the factory was severe but the actors couldn't wear masks. Everyday your nostrils and your spit were dirty. In addition we yelled for a long time in that scene, our voices were a little hoarse and throats a little sore." Despite the terrible environment, everyone still treated the scenes seriously. Wa Jai joked, "Because that is how tough being an actor is." Chow Yun Fat, Aaron Kwok Fu Sing, Zhang Jingchu, Justin Cheung Kin Sing, Liu Kai Chi and Dominic Lam Ka Wa worked on the Felix Chong Man Keung directed, Alan Mak Siu Fai art directed multinational crime film PROJECT GUTENBERG (MO SEUNG) in Canada. When the Canadian production wrapped, Fat Gor of course became everyone's "stamp collecting" target. At the wrap banquet, Fat Gor took selfies with everyone and led to endless laughter. Mainland star Zhang Jingchu even brought her mother to the banquet and revealed that Mama was Fat Gor's fan. She posted online, "Hahaha, it's a wrap. I have never seen my Mama ask for a photo, I discover that she actually is a secret GOD OF GAMBLERS fan." Lam Ka Wa who immigrated to Canada guest starred in the film. He and his wife Lau Bo Chun played host to Fat Gor, Fat Soh and the team. Lam Ka Wa shared photos on social media. "The film PROJECT GUTENBERG after finishing the Vancouver location shoot went to dinner and Zhang Jingchu treated! Guest starring this time in Chong Man Keung's film PROJECT GUTENBERG with a bunch of old friends, I have a lot of fun working and playing...Yeah!" Zhang Jingchu not only treated but also fulfilled Mama's wish of a photo with Fat Gor. 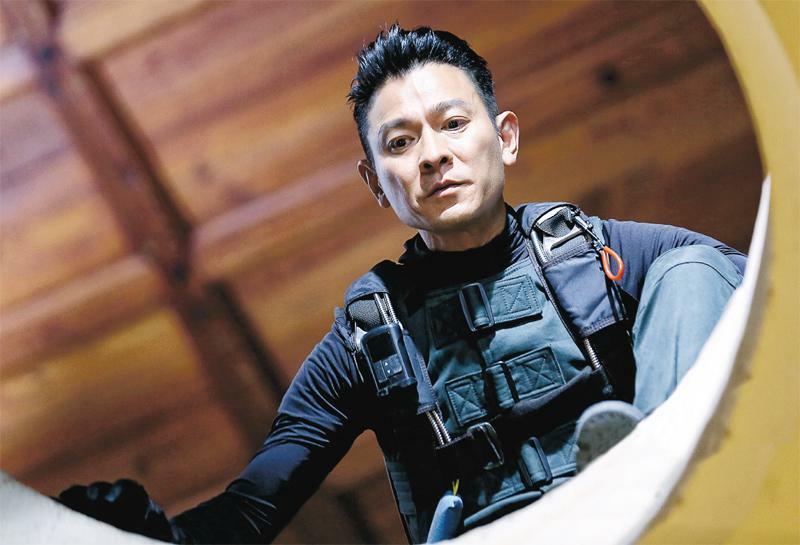 Louis Koo Tin Lok starred in the new film PARADOX (SAT POR LONG: TAM LONG) as an all around good father, who in order to save his daughter fought with martial art actors Tony Jaa, Wu Yue, Chris Collins and others. Goo Jai joked that this performance was his "first action film". Aside from fighting, he also had many emotional scenes. "This time the character had a lot of heavily emotional scenes. A lot of emotions weren't displayed through dialogue. We tried to minimize the lines and move the audience with emotions, looks and action." Andy Tien (On Chi Kit) while working on the film GONG FU LUEN MUN (KUNG FU ALLIANCE) in Ningbo on the 19th had to run then stop and turn. The stunt however tore his right ankle. That night he had to be rushed to the Ningbo hospital for examination. 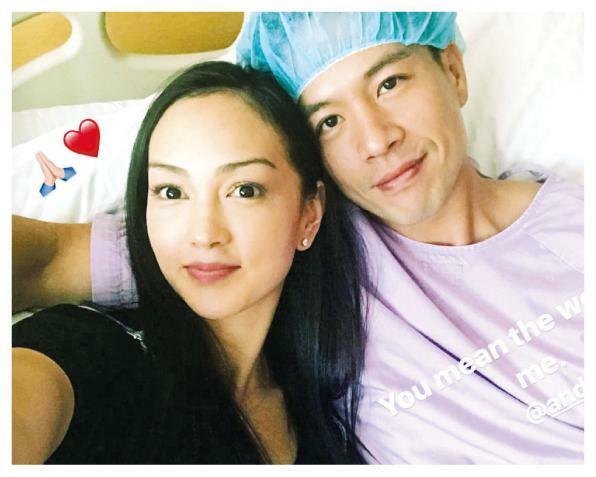 The next day On Chi Kit returned to Hong Kong and was hospitalized for x ray and MRI. The doctor finally decided to operate yesterday. Recovery would take several months, but the film has already started production. On Chi Kit might rest for two weeks before he returned to work. On Chi Kit's management company yesterday said that On Chi Kit's doctor was a expert in the field so he was very well taken care of.